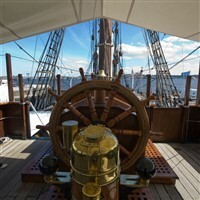 With highlights to Glamis Castle, Scone Palace, St Andrews and Dundees Discovery Point, to follow the footsteps of Captain Scott on RRS Discovery. Based in the beautiful city of Perth, join us for this spring tour to delight in some Scottish heritage and discovery staying in a historic building right in Perths town centre. Sunday  Our luxury coach will depart this morning and travel north to Scotland with suitable comfort-stops on-route. We arrive in Perth ready for tonights evening meal. Monday  Today we visit the beautiful ancestral seat of the Earls of Strathmore and Kinghorne, childhood home of HM Queen Elizabeth, the Queen Mother and birthplace of HRH the Princess Margaret, Glamis Castle. You will enjoy a guided tour of this beautiful ancestral home which has been in the family since 1372, and an inspiration for Shakespeares Macbeth. This afternoon we visit the seaside town of St Andrews, home to British Golf and university of Prince William. Tuesday  A free day today to explore the beautiful city of Perth, on your door step from our hotel. Wednesday  This morning we travel to Dundee and Discovery Point where we will step onboard the RRS Discovery the ship that took Scott and Shackleton on the first expedition to Antarctica. This afternoon we return back to Perth, to visit the beautiful Scone Palace. This historical stately home, one of the most important in Scotland as its been the seat of parliaments and the crowning palace of the kings of Scots including Macbeth and Robert the Bruce. The Palace houses an outstanding collection of antiques, paintings and rare artefacts, along with beautiful world-famous grounds. Thursday  Time to leave Perth and retrace our steps home, back to Wiltshire and your waiting taxis after a memorable Scottish break. Set in a historical building that dates back to Bonnie Prince Charlie, all bedrooms are en-suite with TV, phone, hairdryer and hospitality trays. The hotel sits in the centre of Perth close to the beautiful River Tay.